Funded by a grant from the Andrew W. Mellon Foundation, the primary objective of the Leadership Program is to provide theoretical and practical instruction and useful resources to encourage the development of leadership skills within the HBCU library community and on their own campuses. Twenty librarians representing thirteen institutions participated in the fourth round of the Leadership Institute. The participating institutions are Alabama State University, Bennett College (NC), Claflin University (SC), Coahoma Community College (MS), Delaware State University, Johnson C. Smith University (NC), Lincoln University (MO), Mississippi Valley State University, Saint Augustine’s College (NC), Savannah State University (GA), University of the Virgin Islands, West Virginia State University and Winston-Salem State University (NC). 1. Offer the Leadership Institute for a new group of recently appointed or emerging HBCU library leaders. The goal of the Institute is to provide theoretical instruction and practical lessons while assisting participants in formulating goals and meeting objectives to improve the libraries on their own campuses. The expected outcomes are: improved confidence and leadership skills among participants; improvement of services and strategic plans at participating libraries; and increased engagement of participants in both campus-wide committees and activities and the broader library community. The Institute will be taught for 24 librarians to be selected through an application process. Preference will be given to applicants that are new library directors or emerging leaders. Classes will be offered over a nine-month period and will include both face-to-face and web-based sessions. One-on-one coaching will assist participants as they identify professional goals and strengthen skills. As in past Institutes, mentors will be selected and assigned to participants to provide individualized support throughout the Institute. While mentoring is focused on the Institute, classes and coaching for mentors also will strengthen mentoring on individual campuses and within the network of leadership in the HBCU library community. 2. Continue the staff exchange program for six associate librarians from HBCUs. The goals of the exchange program are to develop skills of emerging leaders and foster connections between HBCUs and with members of ASERL. In an expansion of the program, exchanges will be offered with either ASERL or HBCU libraries. The expected outcome of the exchange program is the development and implementation of projects to advance strategic objectives of the participating HBCU libraries, leading to service improvement and increased engagement with faculty and students on campus. 3. Provide training to improve strategic assessment of library services and mini-grants of up to $7,500 to four HBCU libraries to implement the LibQUAL+® assessment program on their campuses. The goals of the service assessment initiative are to increase understanding and knowledge of assessment strategies, demonstrate the role of assessment in learning about user expectations and improving service quality, and strengthen library capacity for engaging the entire campus community in library planning and service development. The expected outcomes of this initiative are successful implementation of service assessment through LibQUAL+® at four HBCU libraries and the creation of a support group for ongoing service assessment within the HBCU library community. 4. Provide programs to foster local leadership and staff development for HBCU library deans and directors. Four webinars will be hosted to showcase examples of effective staff development that fosters leadership development within the library. 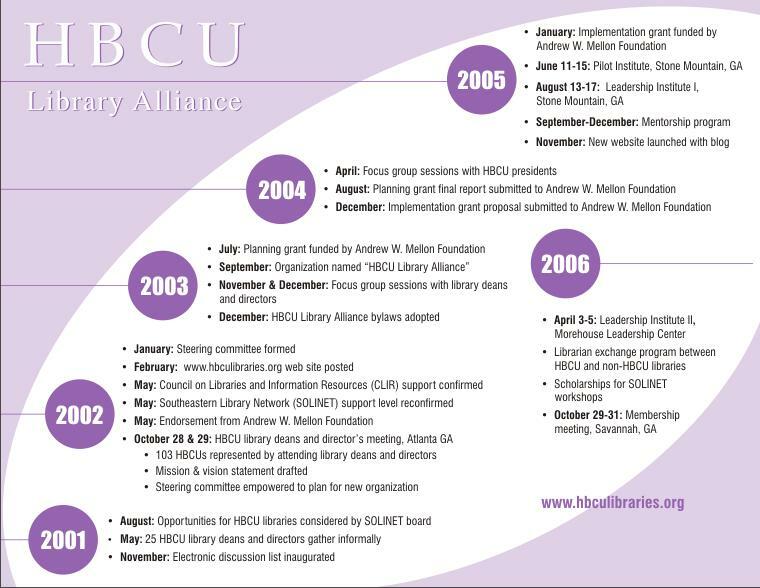 In addition, a face-to-face program will be hosted at the 2012 HBCU Library Alliance membership meeting to share experiences. The goal of this part of the project is to encourage mentoring, coaching, and structured leadership development within individual libraries. The outcomes are expected to be increased awareness of the role that current leaders play in creating new leaders, and an increase in the establishment of specific staff development programs focused on leadership. 5. Develop and implement a post-grant sustainability plan for the Leadership Program. 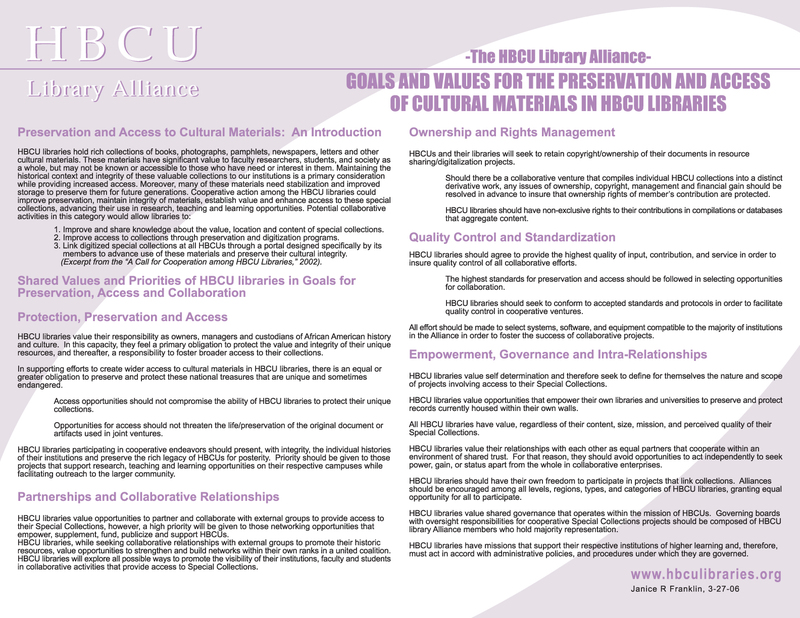 The goal is to provide support for leadership development within the HBCU library community in the future. The outcome is expected to be a financially viable, sustainable plan to continue support for leadership development within the HBCU Library Alliance. Twenty-four librarians representing sixteen institutions will participate in the third round of the Leadership Institute. The participating institutions are Arkansas Baptist College, Cheyney University (PA), Dillard University (LA), Florida Memorial College, Lincoln University (MO), Langston University (OK), Oakwood University (AL), Paine College (GA), Philander Smith College (AR), Savannah State University (GA), Shaw University (NC), Southern A&M University (LA),Texas Southern University, Tuskegee University (AL), University of the Virgin Islands and Winston-Salem State University (NC). assisting participants in formulating goals and meeting objectives to improve the libraries on their own campuses. The re-design is intended to reach a group of emerging leaders with limited ability to be absent from their campus libraries. 2) Continue the mentor development initiative, to provide effective mentorship during the Leadership Institute and to strengthen mentoring on individual campuses and within the network of leadership in the HBCU library community. 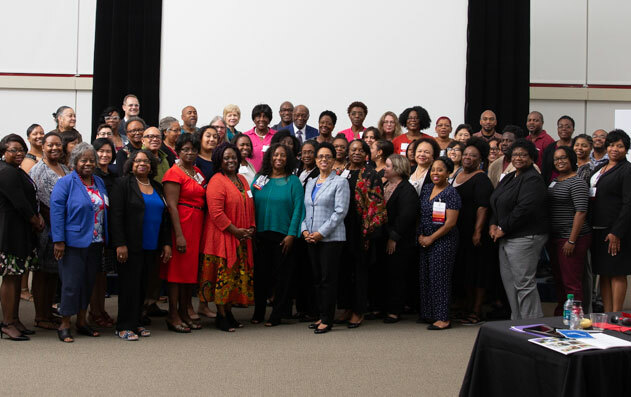 3) Continue the staff exchange program for associate librarians from HBCUs, to develop skills of emerging leaders and foster connections between HBCUs and members of the Association of Southeast Research Libraries (ASERL). 4) Plan and provide a conference on advocacy and networking within the HBCU campus community based on effective use of data in crafting and communicating messages about the impact and value of libraries. The workshop will be held in the second year of the project for all participants in the Leadership Institutes, following an updated statistical assessment of the HBCU libraries. Ten libraries participated in the Leadership Program during Session 1 held in August 2007. The same participants will reunite to present and discuss their projects during Session 2 to be held in April 2008. Twenty three libraries participated in the Leadership Program during Session 1 held in August 2005. The same participants reunited to present and discuss their projects during Session 2 held in April 2006. Below you will find links to the PowerPoint presentations from select institutions. By clicking the 'Download Presentation' link you can download the PowerPoint files to your computer for viewing. You must have MS PowerPoint installed on your computer to view the presentations correctly.